Throwing down a thunderous slam dunk to end the third quarter, Ethan Speaker, a sophomore on Boulder City High School’s boys basketball team, got the ball stuck in the net. 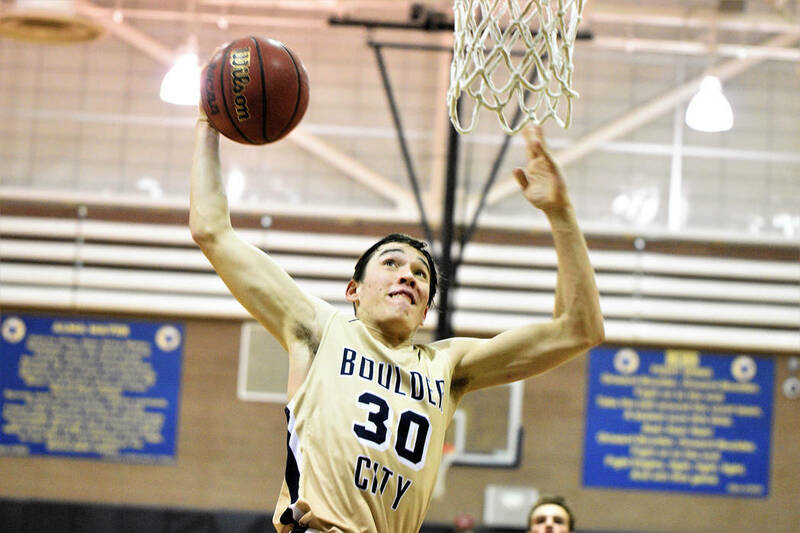 (Robert Vendettoli/Boulder City Review) Boulder City High School sophomore Ethan Speaker goes up for a thunderous dunk against Somerset Academy Sky Pointe on Monday, Feb. 4, 2019. The Eagles won 81-50. That was the only thing that went wrong Monday, Feb. 4, night in the Eagles’ 81-50 victory over Somerset Academy Sky Pointe. Speaker, who scored a game-high 22 points, was key in the Eagles’ 29-7 third-quarter run that broke the game open for BCHS after a subpar first half. Sharing the ball evenly, the Eagles were on fire offensively, with four players finishing in double-figure scoring. Running the paint with authority and dishing out for open 3-pointers, sophomore Matt Morton had a breakout game with a 21-point effort as the Eagles’ youth continues to shine. Also scoring in double figures were seniors Karson Bailey (18 points) and Derrick Thomas (10). The Eagles also swept their regular season series with rival Virgin Valley, defeating the Bulldogs 63-46 on Friday, Feb. 1. Ahead just 28-25 at half time, the Eagles outscored the Bulldogs 35-18 in the second half to run away with the victory. Thomas led all scorers with 25 points, while Bailey added 13. Speaker finished with 11 points and Morton had 10. Looking to close the season strong, the Eagles will face Sunrise Mountain on Tuesday for Senior Night.